Hats off to teachers…it’s time for Mid-Week Focus to open a page on the fun and function of ACTIVITIES with EYE-CATCHING BOOKS! Ask kids which is more eye-catching…something BIG or something small and most will answer BIG! 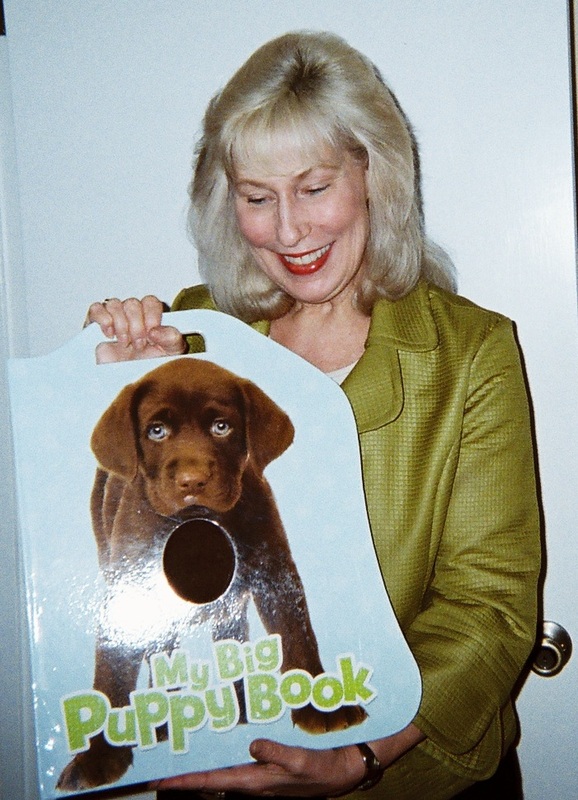 My Big Puppy Book, © Piggy Toes Press, has another eye-catching feature that kids love…a handle for carrying it, as you can see in the pic. You may not believe where I found this treasure (but you know I’ll tell you)…at a local supermarket. True. My Big Puppy Book was sitting on top of a big box of books “on sale,” and it caught my eye immediately as I was passing by. Being a frugal teacher, I decided to ask the store manager if he’d further discount the already discounted price because the back of the book has a small tear in the binding. “$3.00,” he offered. Done! I grabbed the portable pups in print and planned some teaching tricks around this eye-catching book that you can try too. LET’S TAKE TURNS PETTING THE PUPPIES! Books, like My Big Puppy Book that have an additional lovable feature…the soft furry circles at the heart of each puppy, like the one shown in my blog pic here, invite touching and further engage kids. 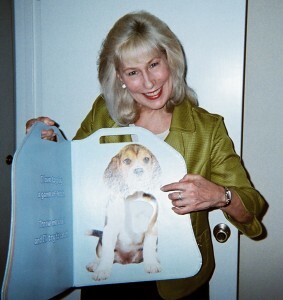 When children participate in reading time with activities like taking turns petting book-bound puppies, they pay closer attention to the text and the pictures. Teachers can make any book more eye-catching – large or small, old or new – by dramatizing Read-Aloud time. Create a Chorus to Repeat the Story Theme – Reading aloud from a chapter book doesn’t have to be strictly verbatim. When you’re preparing for Read-Aloud Time, write a chorus phrase to share with your class that captures the main idea of the story. For example, you might write, “Joey was ready for the challenge, at least he thought he was ready.” Before you begin to read from the book you’ve selected, write the chorus phrase on the board and explain to students that you’d like them to join in when you begin to say it aloud. The class will listen for your prompt, and in doing so, pay closer attention to your reading. Love Those Sound Effects! – Challenge students to listen for the sounds of a story or poem. 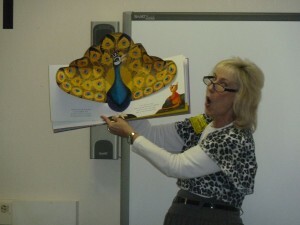 For example, when you’re reading about a haunted house, make a creaking sound and invite the class to repeat the creak. Add other effects as you continue reading eye-catching and ear-catching stories or poems. Pop-Out a Pop-Up Book – Sophisticated or simple, pop-up books, like the one you see in my blog pic below, are eye-catching for children and adults. As you do with “touch-me books,” you can make pop-up books interactive for your listeners, as well as for yourself when you turn the pages. For example, a key word in the book I’m presenting in the pic here is the word long. When I share this book with students in grades K – 2, I invite them to say the word long aloud with me every time they hear me begin to say it as if it were spelled l-o-o-o-n-g! Read more about how to use eye-catching pop-up books in my 08/08/11 post featuring another bargain teaching tool. And don’t forget the fun and function of bookmarks to add wow to eye-catching books. Eye-catching books in the hands of capable, creative teachers bring literature to life and help children learn to love to read. What’s the most eye-catching book you’ve ever shared with children, in any language of the world? Please send more comments and share attentionology.com with other educators. Thanks! ‹ Put a Mask on Creative Learning! 2 Pings/Trackbacks for "Activities with Eye-Catching Books"